As a former City Council Candidate I can attest to how difficult it is to reach a large amount of people with your message. I mean signs are an easy way to clog up street corners and blanket the many shuttered buildings but is this the way we want to learn about our elected officials? I personally enjoyed being on both sides of the booth both as the candidate and the community member seeking a face to face with the candidate. So given the above statement this will stop not only people running for office but it will also stop groups that are there to spread information on behalf of a political organization and will limit your access to regional leaders who come out to their booths and provide staff to answer community questions. 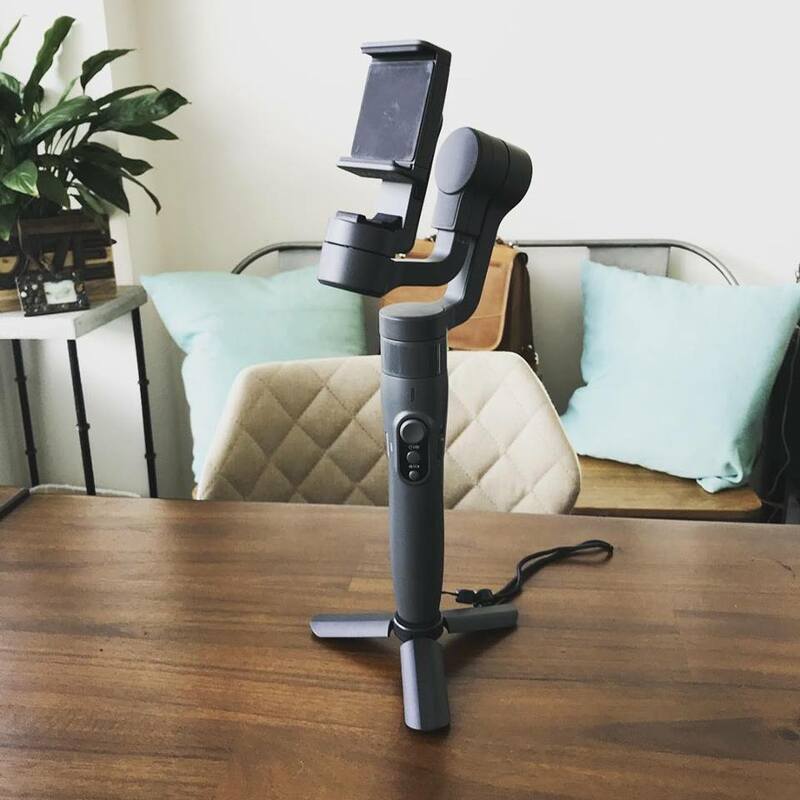 It will officially become harder to meet your elected officials. Is that fair to you? 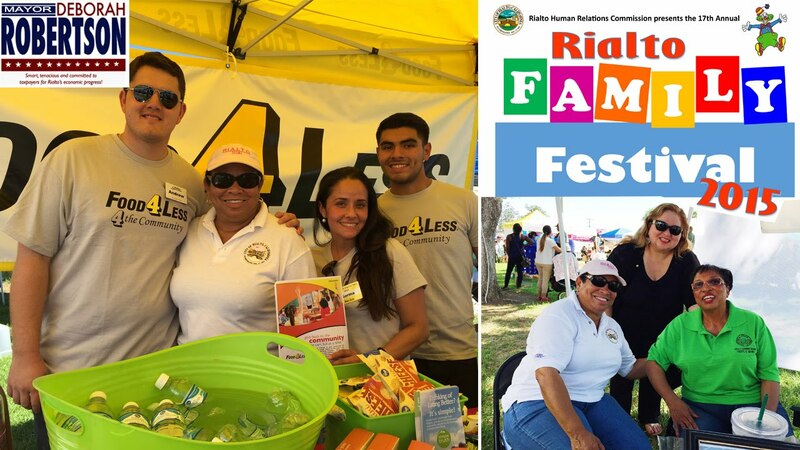 Also at events like Halloween Hi-Jinks where more than a third of the booths were politically based booths where are Rialto youth going to go for a safe trick or treating environment? You see our leaders forget the consequences of their actions when they are trying to damage chances of certain people ever getting elected. Will this apply to the mayors luxury cabana that she has every year at the Family Festival? 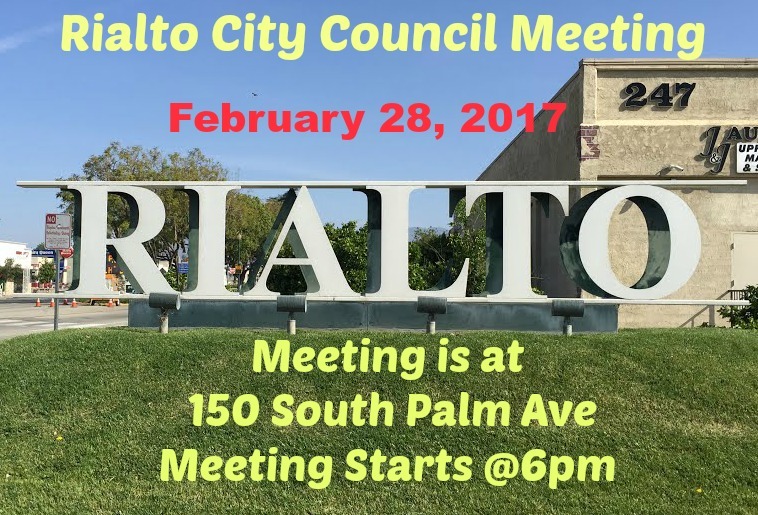 Will this ban groups like the teachers union, Rialto Democrat Club and Rialto Woman’s Club from having booths at Rialto Events? I have been to a lot of events and I have never seen anyone get out of hand, there is no fighting and everyone plays by the rules except those who put random signs up and leave them on city property. So we have to wonder if our new council is counting the costs of their actions? 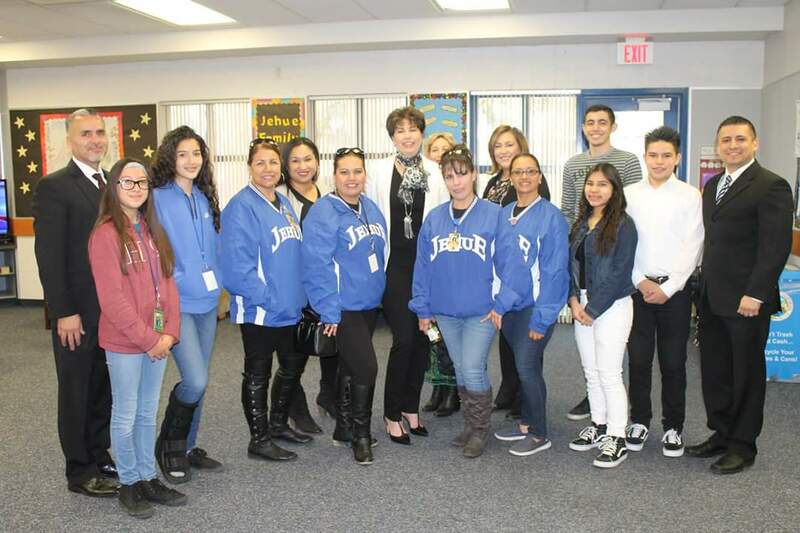 A Senatorial Visit to Jehue Middle School….. 20th District Senator (D) Connie Leyva, visited Jehue Middle School students, staff and parent volunteers this morning to a roaring audience of engaged students. The Senator, who has roots in the Cities of Colton and Rialto (her husband coached in the RUSD District in the late 1980s) spoke to Jehue students in the MPR about the importance of history, education and work ethics “My first job at the union that I was employed for, I took out the trash. I dedicated myself to that task,” explained Senator Leyva. “They noticed. I worked from the ground up, and later, I became the first female President of that Union.” After some loud applause from students, she added, “Never stop working hard, at any level.” The Senator also recognized Jehue Middle School Principal, Mr. Armando Urteaga, much to his surprise, with a “Principal of the Year,” certificate. Mr. Urteaga was one of two RUSD administrators selected by ACSA, Region 12. The other RUSD employee was a former Principal of Jehue Middle School, now RUSD Coordinator of Child Welfare and Attendance, Mr. Leonard Buckner. Enjoy the highlights and GO JAGUARS!! It takes a village of Jaugars to add success. State Senator Connie Leyva walked into Jehue Middle School with a team of smiling and welcoming District officials, students, staff and parent volunteers. The Senator came to speak to the school’s social studies students about history, work ethics and importance of earning a solid education. Parent Volunteers add strength to any schools… Jehue Principal Armando Urteaga introduced the Jehue Parent Leaders, sitting front and center, and thanked them for support. Listening to Jehue Middle School students on stage, RUSD Lead Innovative Agent, Dr. Jinane Annous (far right)and RUSD Superintendent, Dr. Cuauhtemoc Avila (middle) joined Senator Connie Leyva, (far left, in a white blazer) as she was the guest speaker, addressing Jehue Middle School social studies students. Jehue Middle School student/ASB President, Christian Flores, Left) along with ASB Vice President, Lorely Ramirez, did an awesome job in introducing District 20, State Senator, Connie Levya, as their guest speaker. 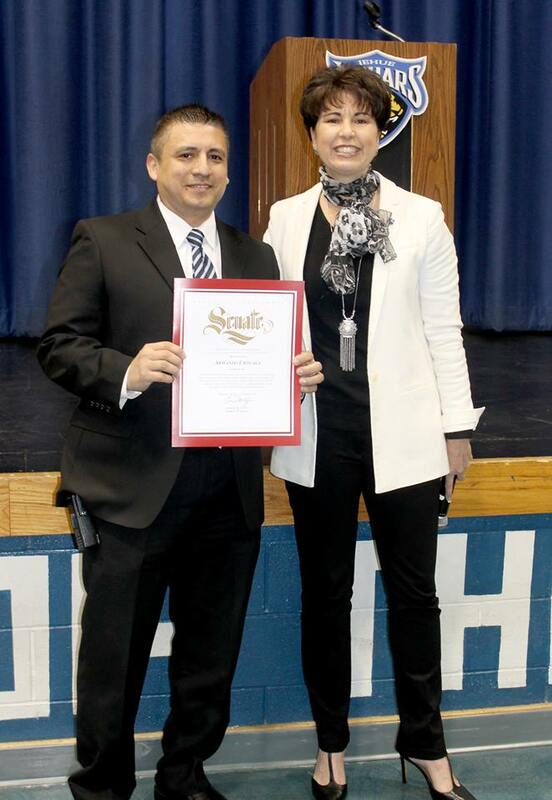 Jehue Middle School Principal, Mr. Armando Urteaga, was recognized by 20th District State Senator, Connie Leyva at Jehue Middle School, when she came to speak to the social studies class. “I found out that he was receiving an honor from ACSA ‘Principal of Year,’ so I also wanted to show my support. 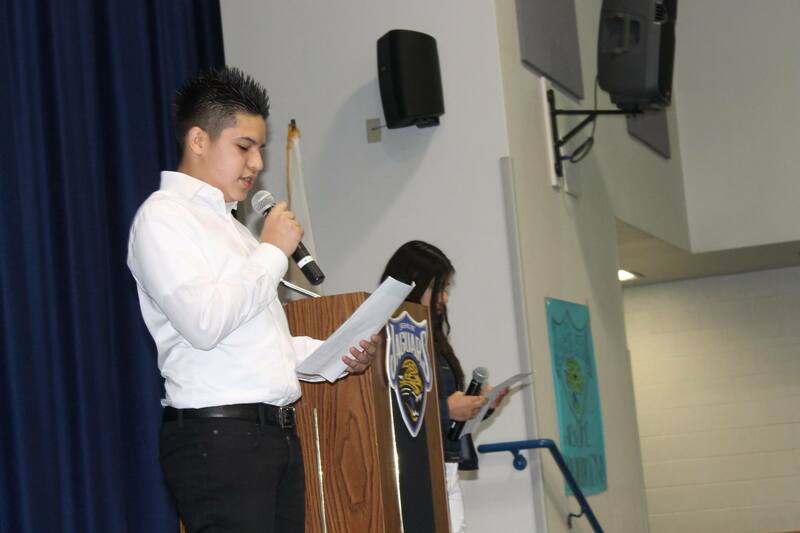 Our principals work tirelessly,” said Senator Leyva. A surprised Jehue Middle School Principal, Mr. Armando Urteaga was recognized by 20th District State Senator, Connie Leyva at Jehue Middle School, when she came to speak to the social studies class. “I found out that he was receiving an honor from ACSA ‘Principal of Year,’ so I also wanted to show my support. Our principals work tirelessly,” said Senator Leyva.